Emirates NBD Poetry for All Competition Honours Students and Performers of Determination at the Emirates Airline Festival of Literature – Emirates Airline Festival of Literature. Dubai, 7 March 2018: The annual Emirates Airline Festival of Literature poetry performance competition concluded today following an intense final round of the Emirates NBD Poetry for All competition. 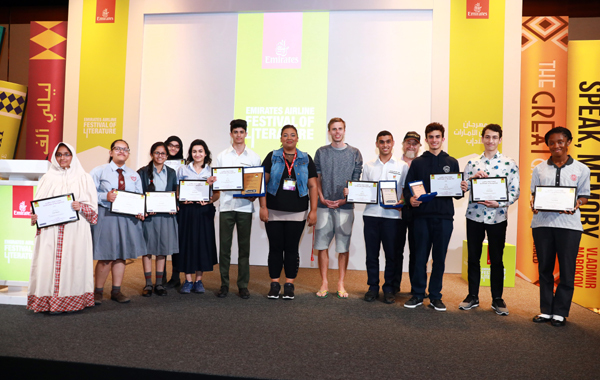 Winners were crowned by Festival 2018 poets Khalid AlBudoor, Nujoom Nasser Alghanem, Afra Atiq and Harry Baker. An unprecedented number of performers entered the competition this year, with 700 students competing in the semi-finals before the top performers in each age group progressed to the finals at the Festival. Participants were evaluated on their interpretation of selected poems as well as their performances. In keeping with the rich Emirati tradition of poetry recital, the Poetry for All competition provides students the chance to exhibit their oratory skills. The competition, held in Arabic and English, is divided into two age categories of 8-13 and 14-18 age groups, with the participants performing their own choice of poems. This year, in collaboration with the competition’s title sponsor Emirates NBD, a new non-competitive performance category for people with disabilities (people of determination) was added to the finals.